A math tutorial/reference covering Pre-Algebra through Calculus. Video lessons supplementing the best existing high school math textbooks with solid teaching by an experienced teacher, Algebra-1 through Pre-calculus. Incremental, building-block approach of regular skills with frequent cumulative assessments. 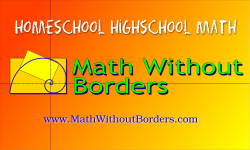 Self-paced math courses designed superficially for homeschool students, does not require parental involvement. Interactive, video-based math courses, includes course notes, worktext, solutions manual. Free online math lessons in Pre-Algebra, Algebra I, Alegebra II, Geometry along with practice tests for the SAT and the ACT. Elementary through early college math education, AP, SAT, ACT test prep course available. Pre-Algebra, Beginning, and Advanced Algebra books designed to make the student think on their own.